Guests are now able to buy the Disney Premier Access at Shanghai Disneyland. Which is essentially a paid FastPass. While we don’t know for certain, one of the reasons for this is maybe in response to the FastPass scalper problem. During our recent visit to Shanghai Disneyland, we did notice scalpers with FastPasses for TRON. 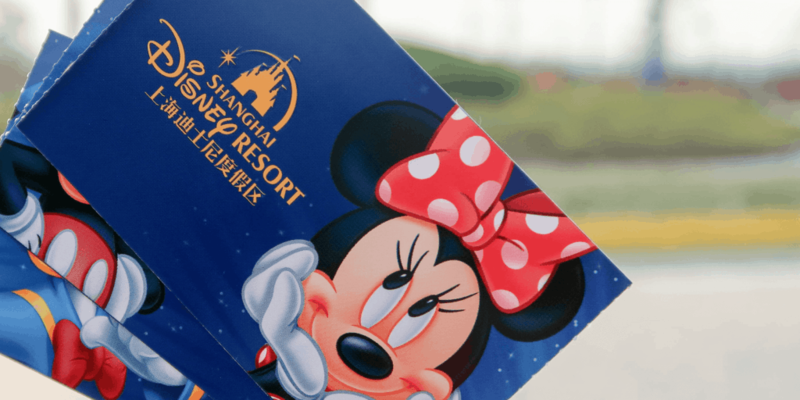 Here’s what you need to know about this new Disney Premier Access at Shanghai Disneyland and if I think it’s worth it. Information on the Disney Premier Access is from the official Shanghai Disney Resort website. This pass allows you to ride seven participating attractions once with priority access — FastPass line — anytime during the day of your visit. There are two types the Disney Premier Access and the Disney Premier Access Set. This allows you to ride one of the attractions listed above once. You can use it at any time. This allows you to ride all the attractions listed above once. You can use it at any time. There are select locations in the park to buy the Disney Premier Access. The official website lists all the locations. While I haven’t used it yet (next trip I will try it and give a review), I would say that it depends on your situation. During our last visit, the only attraction we didn’t ride was Soaring which had an 180-minute wait and no FastPasses were distributed (Roaring Rapids was closed). If this were available, I would have considered it since a few people in our party have never ridden it before and this was their first and only trip. If it’s your only time at Shanghai Disneyland and the wait time is high (and no FastPasses left or distributed for whatever reason), then it may be worth considering. The next part is my opinions based on my experience at the park. I try to give enough information for you to decide if it’s worth it or not. These are attractions that it may be worth using on if the FastPasses done, not being distributed, or the wait time is high. This is in the order of which FastPasses run out first for and have high wait times. Seven Dwarfs Mine Train is popular and FastPasses do run out. But if you’ve done this at the Magic Kingdom then you won’t want to pay for a pass for this. While Peter Pan’s Flight is a fantastic and modern take on the classic attraction, paying for a pass is hard to justify. For these two, get FastPasses for them after Soaring or Roaring Rapids. TRON Lightcyle Power Run FastPasses don’t run out quick and you can get multiple ones on most days (holidays are another story). Buzz Lightyear Planet Rescue almost never runs out unless it’s a holiday or peak day. The Many Adventures of Winnie the Pooh is just not worth it — it’s not that fantastic a ride to justify the cost. If you use our Shanghai Disneyland Trip Planning Guide, get there early, and avoid holidays (wait times drop after the fireworks too). Then there is almost no reason to use this pass. There are instances where the option is nice to have, but I would only use them in specific circumstances. Thank you to Adriel for informing us of this new offering at Shanghai Disneyland. I think this is a truly terrible direction for Disney theme parks to take. Creating two classes of guests – the “haves” and the “have nots” is not part of Walt Disney’s original vision for the parks. Fast Passes should be available for everyone, depending upon how they choose to manage their time in the parks. Shanghai Disney using scalping as an excuse to charge more money, rather than taking measures to actually stopping the scalping, is pretty abhorrent. They’re simply taking advantage of a poor situation to increase their profits. It is sad but true that this was the only way for us to get on Soarin while visiting in April. We didn’t have the time to wait 2.5 hours and fast passes were gone by the time the park “opened” – they actually open the gates an hour before they say they will. I had the same issue on my recent visit in April. The park was scheduled to open at … 8am from memory. We arrived around 40 minutes early to try and get a head start on the security line. We were in line for actual entry into the park at around 7:30am and noticed people starting to run “inside” the park. For some reason, they’d started to let people in early, but there seemed to be a miscommunication as some “lines” were being processed for entry but others weren’t. It was a frustrating experience, made all the worse by how long the cast members take to process what I’m guessing were “online” tickets for guests. They really need to require people to process / exchange their tickets somewhere else as it made it impossible to judge which line would actually move quickly. Thankfully I still made it to Soaring in time to grab Fast Passes. I had multiple issues with the “times” communicated by Disney while there. Another time we turned up to a character meet 15 minutes before the scheduled “start” time, only to find the character already there AND they’d already closed the line. It was ridiculous as the meeting obviously started at least 30 minutes before the signposted time. Disney had also advised that Pirates would be closed in the morning until 1pm, but it ended up being open in the morning and closed around 3pm! That was particularly annoying as we’d “skipped” Pirate / Treasure Cove all morning believing that Pirates was closed, then decided to go back later in the afternoon (believing it would be open), found the wait time was quite long and decided to simply wait a couple of hours only to then find that they’d closed the ride for the remainder of the day / night.